The Information is provided for information purposes only. The Information is not intended to be and does not constitute financial advice or any other advice. The Information is general in nature and is not specific to you. You should not make any decision, financial or otherwise, based on any of the Information without undertaking your own due diligence. The US Dollar is looking like the stock market....about to plunge. So what does that mean to you and me? Well for a lot of US companies it would seem to be a good thing. If the dollar falls the cost for other countries to buy our goods and services goes down. That leads to an increase in our exports. On the flip side, it means that it will cost you and I more to buy goods because the U.S. is a net importer. The bigger problem is what I see longer term. As in my earlier post regarding the global debt crisis, the US debt could lead to a collapse of the US dollar. I will preface this with saying that I feel this scenario is the most unlikely to unfold however, it is a possibility. What would happen if the dollar collapses? This scenario is not pleasant at all. Most of the world trade today is done in US dollars. Most foreign nations hold a lot of US dollars in reserve due to this fact. What if those countries suddenly lost confidence in the US solvency? They would dump dollars leading to a snowball effect of selling dollars. This would lead to at first more deflation like we have experienced thus far but then it would lead to hyperinflation and the destruction of people's savings. What that means is that if you have $1,000,000 dollars saved, the buying power is diminished significantly. You would still have $1,000,000 but what you could buy with that million dollars goes down significantly. So a gallon of milk that today is roughly $3.50 would suddenly be $100 or $1000 dollars. Sounds crazy right? But it has happened many times in history in the case of a total currency collapse. I do not watch the news or read the newspapers. Any opinions I form are based entirely on my own research. If I want economic data I go to The Federal Reserve or the US Treasury websites and look at the data for myself. Here are 2 charts from the St. Louis Federal Reserve website. 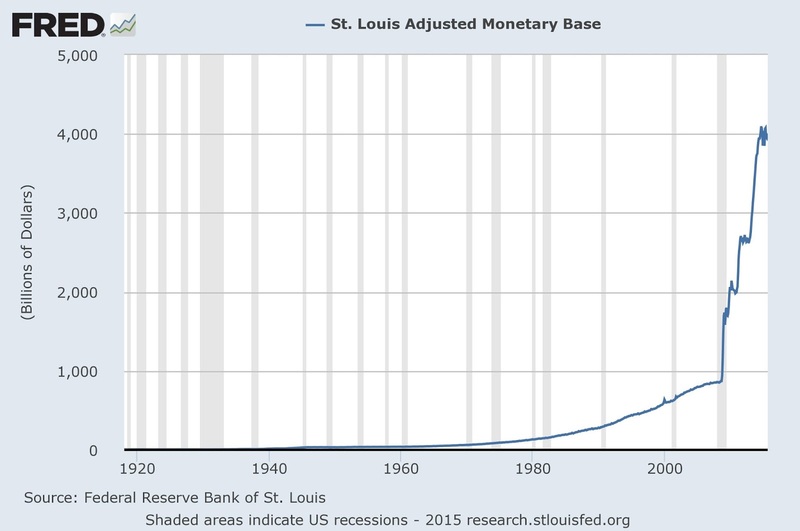 As you can see, the money supply has gone parabolic while the velocity of money is plunging. What does this mean in layman terms? The unprecedented QE has exploded the supply of money. The idea was to pump money into the economy and stimulate economic activity. So how do you measure it's effectiveness? 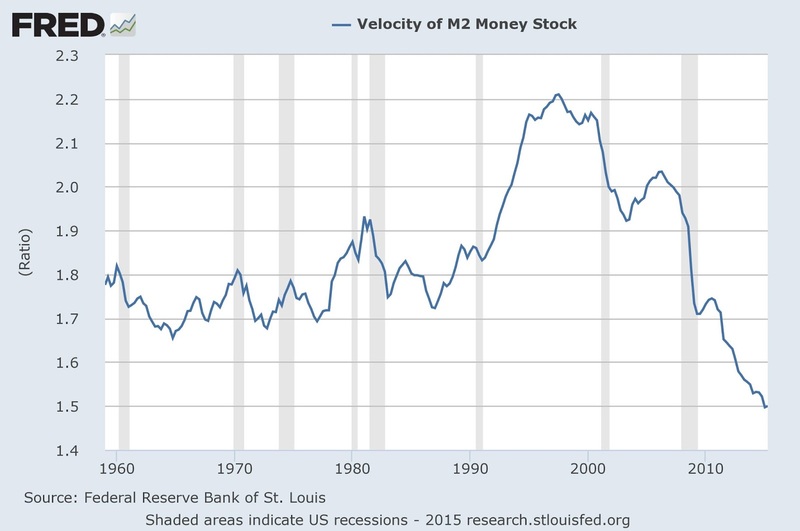 The best way is to look at the velocity of money to measure economic activity. If I buy a sandwich and I leave a $1 tip, then the waiter takes a cab home and uses that $1 to pay for the cab and then the cab driver uses that $1 to pay for gas, that would have a velocity of 3. If instead the waiter took my $1 and put it in a jar and didn't invest it it would have would have a velocity of 1. Velocity measures the speed that $1 moves through the economy or how many times it moves through the economy. 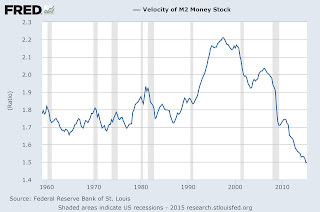 As you can see on the chart, the velocity of money is plunging while the money supply is exploding. In other words, QE did not work and the real economy is about to become known. We are already in a recession. QE ended in October 2014. QE was artificially holding up our economy. 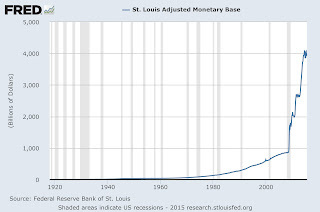 Now the massive money supply is out there with no economic growth. I am not a doom and gloomer. I was quite bearish from 2007 to early 2009 but then I became extremely bullish in March of 2009. I have remained a cautious bull until the beginning of this year, 2015. I am a trader so all of my market directional opinions are based on technical analysis. As you know I am very bearish and feel that 2016 is not going to be a good year for the stock market. Will The Fed Raise Rates Tomorrow?